How many of us get to say we have the bathroom of our dreams? 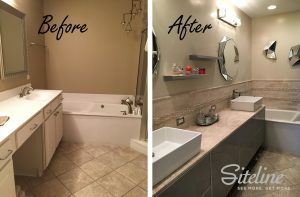 Carla Moman, business solutions manager for Siteline Cabinetry gets to say that every day, since she and husband Tim recently remodeled their Indianapolis master bath, featuring what else – Siteline cabinets and storage. Carla tells us, “The look is exactly what I wanted.” She adds, “Our condo is already extremely contemporary and we wanted the master bathroom to be an extension of the space. 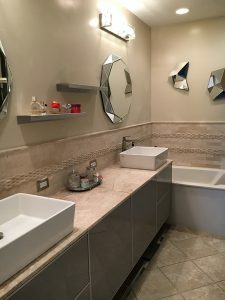 “When we first purchased our condo, I had always known we were going to renovate the master bath, as it really didn’t fit the rest of the space,” notes Carla. Carla and Tim started their search for bath remodeling inspiration like many of us do – by letting our fingers do the walking through social media. 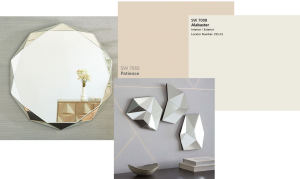 Carla comments, “I was originally inspired by the Stone Grey glass insert when Siteline was first launched.” She continues, “I previously had two white Thermofoil particle board cabinets with a knee drawer in the middle. 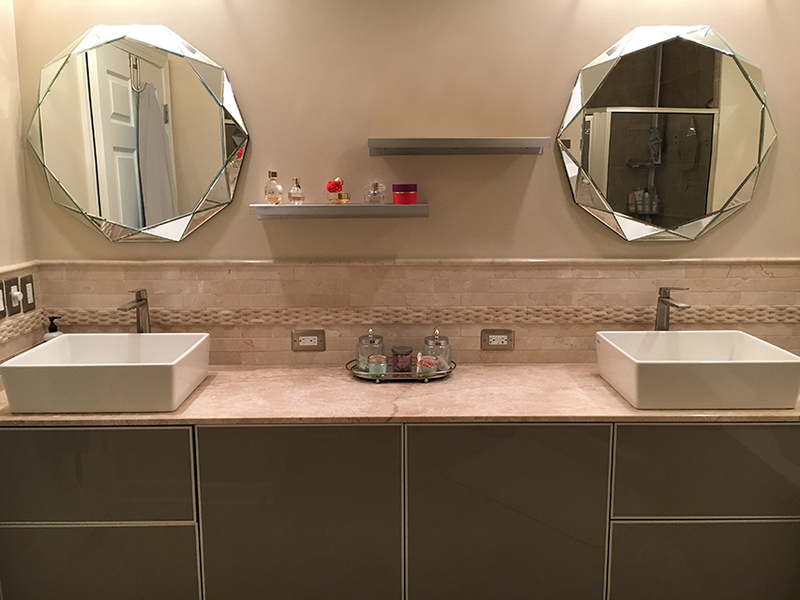 “I only had two drawers and little cabinet storage underneath the sinks. I needed to have a space to allow for all the little things that a bathroom could hold. I don’t like baskets or mini makeup bags so having built-in dividers inside the drawers were extremely important to me. 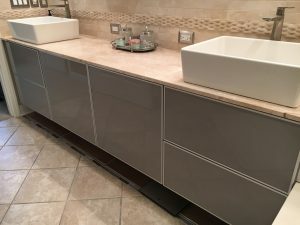 Carla and Tim selected a “floating” style vanity design featuring Siteline Reski metal doors, which have a low profile frame in a bright Aluminum finish and Stone Grey acrylic inserts. Designer note: Stone Grey is a grey-beige color, which is a very popular neutral for today’s kitchens and baths. Want to see more metal door styles from Siteline? Click here. (Check out the Mazor, Patel and Volta optional metal door styles.) Want to see more acrylic insert colors? Click here. You too can mix and match styles and inserts to create your own personal style, and go from blah to spa! Other products in this remodel: trim paint is Sherwin Williams® 7008 Alabaster, wall paint is Sherwin Williams 7555 Patience, vanity countertop is Diano Reale Polished Marble with an A-5 edge profile, lighting is Latitude Bathroom Vanity Light from Lightology™, sinks are American Standard® White Loft 19-5/8″ Vessels, faucets are Kraus® KEF15300BN in Brushed Nickel, and mirrors are sourced through West Elm™.